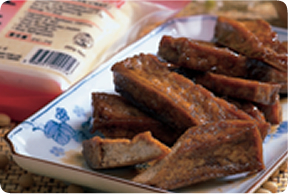 Deep fry tau kwa strips in hot oil (180°C) until crispy. Drain. Mix seasoning and bring to boil. Add fried tau kwa. Cook until gravy thickens. Sprinkle with sesame oil.